Growing up in the Jewish community of Caracas, Shabbat dinners in Aquiba Benarroch’s family moved each week, back and forth between the homes of his two sets of grandparents. His Moroccan grandmothers Cota and Luna would lay their tables for close to a dozen family members, starting the meal with “the million salads,” as Aquiba calls the first course. Salads like tomato and avocado with green onion, bitter orange salad, another with red pepper, a beet salad, and one with carrots. Next was a course of pastela, or a potato casserole. 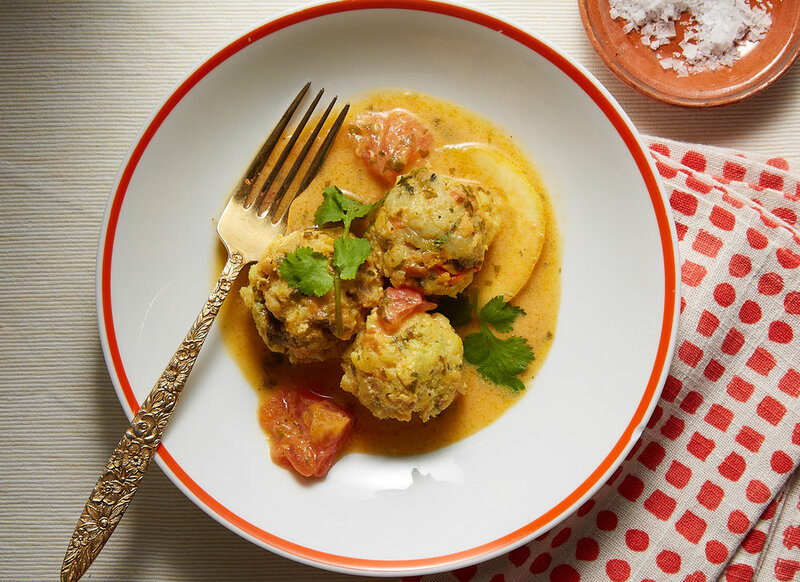 At his maternal grandmother Luna’s home, the second course was often fish, served as albondigas de pescado, or ground cod or halibut carefully formed into balls and simmered in a sauce of tomatoes, garlic, saffron, lemon, and cilantro. And finally, there was a stew or meatballs. Despite being in Caracas, Shabbat meals in Aquiba’s family always drew on the Moroccan kitchen and the recipes his grandmothers brought with them. 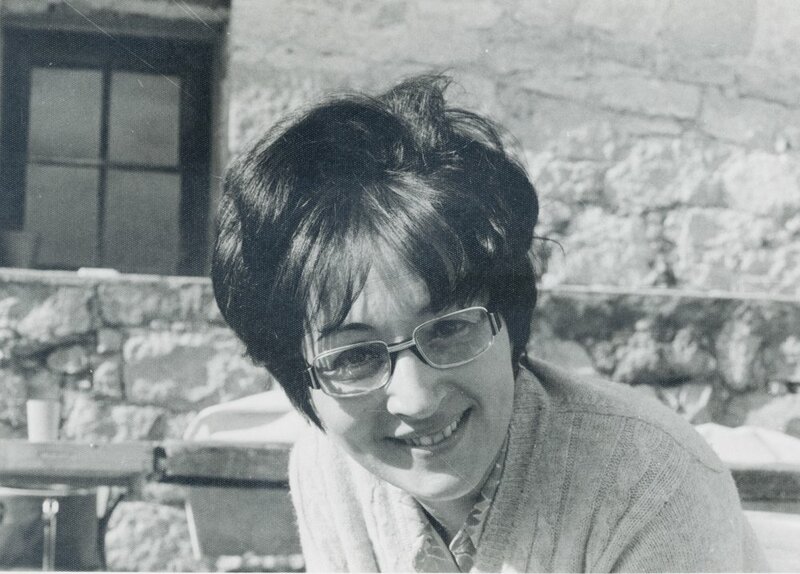 Luna in Madrid in the 1970’s just before moving to Caracas. “Back in the 70’s, Venezuela was one of the wealthiest and fastest growing countries in the world,” Aquiba explains. Both sides of his family moved there, joining the community of approximately 15,000 Jews living in Caracas then. His parents whose families knew one another in Morocco met and married and Aquiba grew up here, attending school and spending his free time at Hebraica Caracas, a Jewish community center. In more recent years, as life in Caracas has toughened, parts of the family have left. Luna moved to Madrid, as did Aquiba’s parents, and with them came the family’s Shabbat dinners and recipes including the albondigas de pescado. Aquiba, moved to Israel where he met his wife Amy, and ultimately, the two settled in Brooklyn. Amy’s Ashkenazi roots mean their Shabbat dinners in New York often blend culinary traditions. A year ago, when Aquiba and Amy were hosting a pescatarian Shabbat dinner, Aquiba thought back to his grandmother’s albondigas de pescado. He took a recipe from Recetas Endiamantadas: La Cocina Sefardí de Ana Bensadon, an iconic Spanish-language Sephardic cookbook that Luna gifted Amy before the couple was married, and adapted it. 1. Make the fish balls: place the fish, garlic, and cilantro, in the bowl of a food processor. Pulse until ingredients are well combined, but not pasty. 2. Place the mixture in a medium bowl. Squeeze all of the water out of the slice of bread and place in the bowl with the mixture. Add the nutmeg, salt, pepper and egg yolk and mix by hand, breaking up the bread, until evenly combined. 3. For the sauce: heat oil in a medium saucepan over medium-high heat, add the garlic and let sauté until fragrant. Add the tomato, saffron, salt, and pepper. Let cook for 8-10 minutes until tomatoes begin to break down. Add the cilantro and lemon slices and simmer over low-medium heat. 4. While the sauce cooks, roll the fish balls. Pinch off ~⅓ cup of the fish mixture and roll it into a round shape about the size of a golf ball. Repeat with the remaining mixture. 5. Add the fish balls and a ½ cup of water to the sauce. Cook until sauce reduces and thickens and fish balls are cooked through, about 25-30 minutes. 6. In a small bowl, whisk the egg yolks and lemon juice together. 7. Remove the fish balls and sauce from the heat and pour the egg and lemon mixture into the pan, swirling to combine. 8. Serve immediately with Jasmine rice.